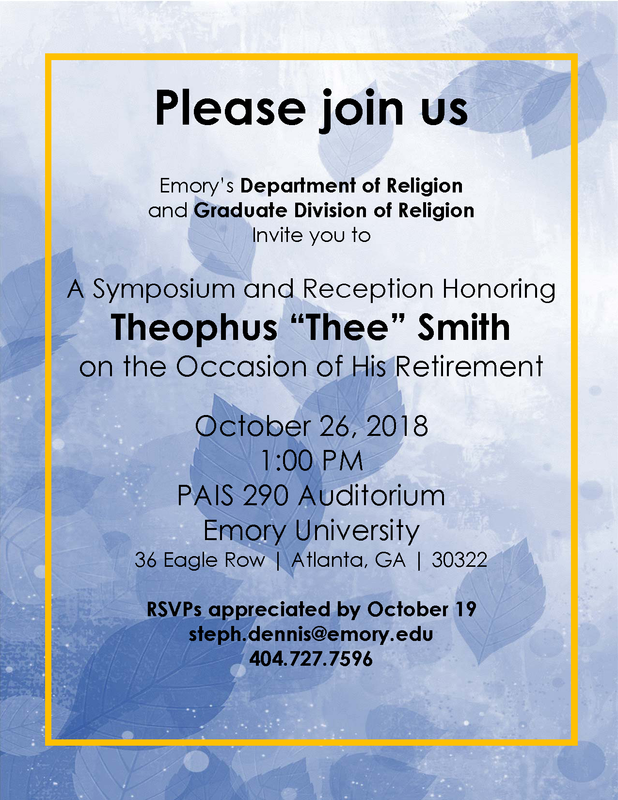 Emory’s Department of Religion and Graduate Division of Religion Invite you to A Celebration Honoring Theophus “Thee” Smith on the Occasion of His Retirement. Sponsored by the Department of Religion and the Graduate Division of Religion of Emory University. Emory's annual Tenenbaum Lecture will explore "The Jews of Cuba and Their Diasporas: Memories, Stories, Dilemmas," with guest scholar Ruth Behar of the University of Michigan. Although a miniature community of a thousand people, the Jews of Cuba have attracted wide attention for choosing to shoulder the responsibility of safeguarding the Jewish legacy. At the same time, the Jewish community has been affected by the continual loss of its members through the many migrations that have taken place since the early years of the Cuban revolution to the present day. The lecture will address the contradictions surrounding Cuba's Jews on the island as they forge a path between the scroll and the revolution, between Jewishness and Cuban citizenship, while also exploring the connection to and separation from Cuban Jews in the diaspora. Please join us for a reception after the lecture. Books will be available for purchase. Placing African American religious history within an Africana context requires us to pose new questions and embrace innovative methods to learn more about the spiritual lives of African-descended people in the past. “Hidden Sources” presents novel approaches to this past that focus on notions of pluralism and indigeneity fundamental to the germination of African American spiritual cultures. Through examples of domesticated plants, plantation technology, and sacred bowls, we can access “hidden sources” that reveal how people displaced to new ecologies established communities in early African America and nurtured religious cultures that sustained these communities over many generations. Entering into the Kuchipudi village in Telugu South India as both a trained dancer and ethnographer, Harshita Mruthinti Kamath found that participating in dance became the primary way of forming relationship with her interlocutors. In this talk, Kamath analyzes the intersections of kinesthetic empathy and dance in the context of ethnographic fieldwork. In her presentation, Kamath asks: what does it mean for the ethnographer to put her “body on the line” through dance? reflected tensions in the local context. From the nineteenth century to the present day, outsider perceptions of African-derived spiritual practices have played a central role in debates about the extension of civil rights and liberties to persons of African descent in the Americas. This presentation will explore the origins of the most common word used to stereotype African American and other African-based spiritual belief systems: “Voodoo.” It will discuss the evolution of the term over the last 150 years through case studies of the popular interpretations of “Voodoo” during significant historical moments such as Reconstruction and the Civil Rights Movement. Through this discussion of “Voodoo,” we will explore how rumors and stereotypes of African rituals have formed a barrier between African Americans and the enjoyment of human rights, both historically and in the 21st century. This presentation examines how events at the U.S. Mexico border such as toll-disagreements, climactic disasters (1954 Hurricane Alice), and inoperable, mismanaged infrastructure deepen strained relations of inequality and disparity between the two countries. It focuses on ritual and festive crisis resolution strategies deployed as part of the initiative known as paso libre (open border), promoted as part of the Washington’s Birthday Celebration’s annual International Bridge Ceremony (est. 1898). Drawing on extensive ethnographic and archival research that includes uncatalogued documents, it captures how the act of physically meeting in the middle of the bridge paired with the long-standing cross-border social and cultural expectations attached to the ritual not only made paso libre possible, but also sustainable (1957-1975). Engaging scholarly work in Latinx Studies, Geography of Religion, Hemispheric American Studies, and Comparative Border Studies, this talk shows how performative strategies such as this facilitate communication across federal, municipal, and civil society channels and make stakeholders out of an international public. Writing in The Souls of Black Folk in 1903, W.E.B. Du Bois described the Black Church as the social center of African American life in the United States. More than a mere house of worship, the Black Church was home to “the Sunday-school, two or three insurance societies, women's societies, secret societies, and mass meetings of various kinds.” In this way, the Black Church was a universe unto itself, reproducing, in microcosm, all the worlds of political and social life from which African Americans were cut off by racism and discrimination. Standing at the center of this insular world, the Black Preacher was not only a leader in matters religious and moral, but also “the healer of the sick, the interpreter of the Unknown, the comforter of the sorrowing, and the supernatural avenger of wrong.” Over the course of the 20th century--and even into the 21st--Du Bois’ view of the Black Church has prevailed. For more than 100 years, prominent thinkers and writers--both scholarly and popular; religious and lay alike--have taken Black Christianity as the sine qua non of Black religiosity in the United States. When followed to its furthest extent, this view has located, in African American Christianity, a compelling origin story for Black identity in the United States. Writing in “What Was African American Religion?” Jason Young argues that recent scholarship on Black religious practice not only challenges Du Bois’ insistence on the centrality of the Black Church, but also calls into question some of the foundational tenets that lay at the heart of African American Religion. Revisionist views of the past along with speculative imaginings of the future are calling into question long-established periodizations of black life and religiosity. At the same time, novel cartographies of slavery and its aftermath are causing once stable notions of place and space to shuffle and shudder under our feet. Finally, new and insurgent calls from various marginalized communities are forcing a moral reckoning with old, outmoded forms of authority and power. At the turn of the 20th century, The Souls of Black Folk responded to the need for a vision of Black religiosity that might exceed the bounds of slavery. Writing in “What Was African American Religion?” Jason Young imagines what new frontiers lay ahead.